1976 was a pivotal year for the Grateful Dead. After an 18-month hiatus that saw just four Bay Area appearances by the band, but also a phenomenal studio album, Blues for Allah, and a slew of solo projects, the Dead returned to the road at the beginning of June ’76. Mickey Hart was officially back in the fold after a long absence, and the band came back with a batch of new songs and fresh approaches to playing their old ones. This latest — and last edition of our Road Trips series, Vol. 4 No. 5, was drawn from two shows early on what was dubbed by many Heads at the time as the GD’s “comeback” tour. 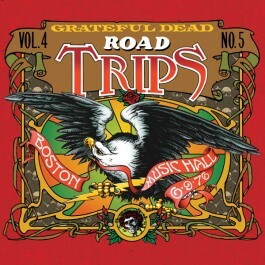 It contains the truly awe-inspiring complete June 9, 1976 Boston Music Hall show (just the third of the tour, but you’d never guess that), and also a handful of hot tracks from the June 12 show at the same venue. For a band that hadn’t played together in eons, the Dead sound remarkably self-assured and on-the-ball throughout. The first set includes stand-out versions of then-new songs such as “Crazy Fingers” and “The Music Never Stopped,” just the third version of “Cassidy,” a neatly jammed “Scarlet Begonias” and a potent “Ship of Fools,” among other gems. The second set opens with a long, circuitous “St. Stephen” (the first in five years! ), then goes into a tremendous “Eyes,” followed by “Let It Grow,” which was now independent of the first two parts of “Weather Report Suite.” “Samson and Delilah” and “Lazy Lightning” > “Supplication” were brand-new to the Dead repertoire, while the bevy of rearranged songs included “High Time” and the famous disco-influenced “Dancing in the Street.” The encore was another recent one: “Franklin’s Tower” (which would never be played in that slot again). For a band that hadn’t played together in eons, the Dead sound remarkably self-assured and on-the-ball throughout. The 6/12/76 songs include one of only five versions of “Mission in the Rain” the Dead played, “The Wheel” (a few years old, but new to the stage), the revived “Comes a Time” (last played in ’72) and a “Sugar Mag” sandwich with a great “U.S. Blues” as the meaty filling. As with all the previous Road Trips releases, this final entry comes with a colorful booklet containing an essay and period photos. And needless to say it has been mastered to HDCD specs by Jeffrey Norman. Ask our editor Neil McCauley: DAMPING FACTOR: Is it important?